Everything you need to know to pass the CompTIA 220-901 and 220-902 A+ exams! Full color. Educators contact us for special pricing and instructor resources (minimum purchase required)! 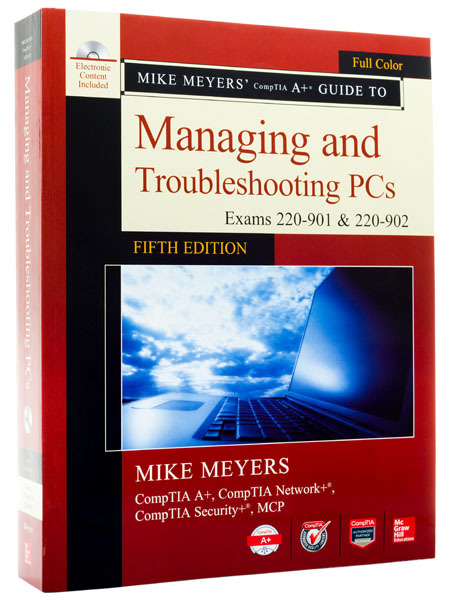 One of the only books currently available for the new CompTIA A+ certification exams, 220-901 and 220-902. 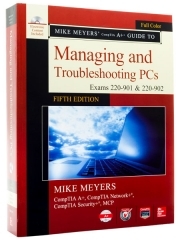 The A+ Guide to Managing and Troubleshooting PCs covers everything you need to know to pass these exams. Soft cover, full color book, formatted specifically for the classroom. Mike Meyers, the leading authority on CompTIA A+ certification and training, has helped hundreds of thousands of people pass the CompTIA A+ exams—and now he can help you too! Install, configure and troubleshoot hard drives. Install, upgrade, and troubleshoot modern Windows. Ideal as both a study tool and an on-the-job IT reference. For the “Ultimate Arsenal” combine our book with the CompTIA A+ Super Bundle: Video Series, Total Sims, Total Tester. This combination provides everything you need to pass the CompTIA A+ 220-901, and A+ 220-902.